A mini glue gun with a low temperature like our LT-160 is ideal for delicate pieces on ribbon or lace in crafts. 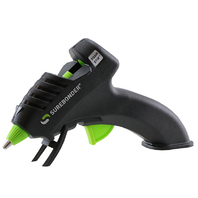 This 10 watt low glue gun melts glue at a lower temp creating a safer way of gluing. Great for use with our mini glue roll which allows you to continuous glue during your project, or use with mini glue sticks.